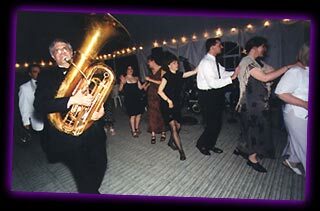 "Saints of Swing are the best wedding band I have ever seen. And I've seen a lot of them." "We loved having the SAINTS OF SWING play at our wedding! What incredible musicians they are." "Thank you for a wonderful band for the wedding. You were all great and people are still talking about the fabulous music!" "The audience enjoyed your playing tremendously. Your performance was a special treat for all who heard it." "The concert was not only cultural and informative, but also very entertaining and enjoyable... A high-caliber performance." "Thank you for helping to make our wedding day so special. You helped keep us calm and loose... and the music was HOT!" We'll have a great time!